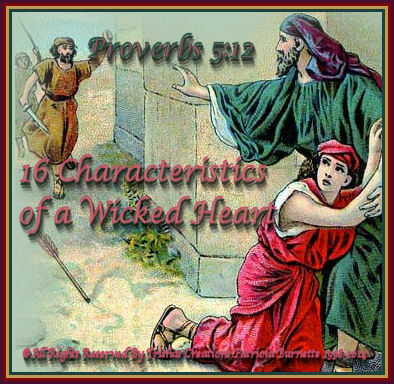 "16 Characteristics of a Wicked Heart"
Welcome to "16 Characteristics of a Wicked Heart"
This is one reason why this world is in turmoil, people's wicked and hateful hearts. They seek vengeance and they sick to ruin and corrupt people and their countries. Just look at what's happening around the world now. So much hatred and so much animosity towards people that has no reasons to be hated. I have listed several Scriptures and verses below which show the wicked hearts. The wickedness can completely destroy other's, even our words can kill other's and their spirits, many people commit suicide and they cause harm to other's. I pray that this helps many who are going through the same thing our world is and to help you let other's know this is NOT the way God wants it or ever wanted it. God wants us to all repent and live in unity and love, not all this wickedness.